The first woman to fly with the Red Arrows display team is to move to a ground-based role. 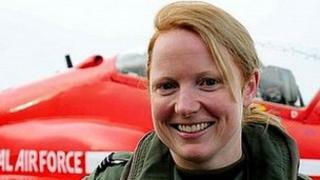 Flt Lt Kirsty Stewart, formerly Moore, 33, joined the Lincolnshire-based unit in 2010. The Ministry of Defence said the move was not linked to any disciplinary issues or related to her gender. The move follows the deaths of two Red Arrows' pilots during 2011. The team will display with seven planes in 2012, but with nine for ceremonies. A Ministry of Defence spokesman said: "The Red Arrows will conduct aerobatic displays with seven aircraft rather than the usual nine in 2012 due to the unavoidable posting of one of their pilots. "With safety paramount, but the quality of the displays vitally important, it has been decided that seven aircraft presents the most visually balanced and dynamic formation. "The team will still carry out official flypasts with nine aircraft. The Red Arrows will return to a full aerobatic formation of nine aircraft in 2013." Retired Air Vice Marshal Jerry Connelly said moving to a seven jet formation makes sense. "Because of the way the formations work, an odd number is right. "So if one drops out, in a normal show for example, rather than fly in a formation that would look odd with eight of the nine aircraft in it, like a diamond, it is better to take two out and fly a smaller but still symmetrical shape". Flt Lt Sean Cunningham, 35, was killed on 8 November when he was ejected from his plane while on the ground at RAF Scampton. The accident came less than three months after Flt Lt Jon Egging, 33, was killed at the end an air show in Dorset.